Ahoy! 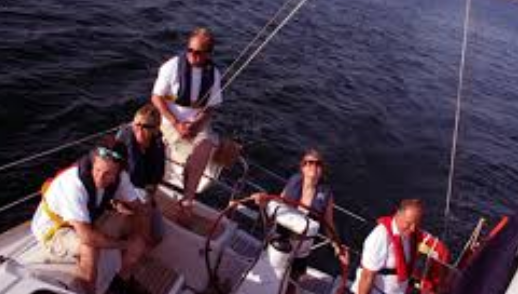 Welcome to our short guide for day skipper sailing. In this 3 part series we will teach you about navigation, your chart work, rules of the road, boat handling, all the things you’re going to need so that when you step up to the mark. And you’re behind the wheel of one of the great boats you will be skippering – not only do you understand how it all works, but you feel confident in doing it. Let’s take a look onboard, one of the key things you’ll notice. When you become a day skipper is that dreaded word, responsibility. You’re going to be responsible not only for forty one foot of yacht, but for the safety of your crew and of course yourself. With responsibility, you need to be aware of how the system on a boat works. A boat is one of the last places, thankfully not run by a committee. On board here, Skipper is King. But the king needs a good crew. And the interface between the skipper and the crew is paramount to a boat working properly. The crew need to be supplying lots of information back to the skipper. The skipper in return need to be giving them lots of information and telling them what’s going on. The old adage is true that a good skipper appears to be a lazy skipper. Well not really lazy, but delegating various jobs about the boat, to the crew so that they get to enjoy it and their part and part of things. A good skipper appears to be a lazy skipper. As a day skipper, you’re going to be responsible for the safety of the pilots and for the crew. You need to be sure that you delegate the duties, the jobs around the boat so that everybody becomes involved in the running of the boat. Don’t forget the day skipper ticket is the driving license for one of these, so you can charter a boat anywhere in the world. As skipper, your main responsibility, will be to look after the pilotage of the boat into a new port. Your position when you do that is here in the cockpit of the boat. It’s not down below at the chart table where so many people tend to think it is, here in the cockpit. Here you are in control of the boat and everything that goes on around you so pre-planning is really, really important. As skipper you want to make sure that one of your daily checks that you do on your yacht is to make sure that your engine is all up to spec. Check out more videos at this stage if you feel you need to know more. Back in the competent crew lesson we detailed the wobbles that you need to run through that little checklist that you have of W O B B L E S, so that was water, that was oil, that was belts, that was battery, that was leaks, Electrics, save. You need to make sure that everything is working nice and sweetly on the engine. In addition to that we need now need to take you through an additional checks that you need to run through as skipper by way of fuel and making sure the engine does run itself. The first thing, let’s get the engine compartment open. Make sure everybody on the boat in a where that the companion ways out of action and by way of access, I just opened up the side hatches and indeed taking off the lower step as well. W. That’s water, she’s water code and in here we’ve got the radiator. Check we’ve got water in the radiator. Under the cap, stick your digi in, little bit of water that is fine, the second thing we are going to do, O, O for oil we need our kitchen roll for that and our dipstick on the engine off to the side. Here we are nice and black, engine is always black. Pop it in, make sure you park the boat on a nice level surface and out she comes, perfect, just underneath the top mark. That’s our oil. B, B for belt. That’s the alternator belt. There we go. This belt that runs around here. Go to midpoint on the belt. Should be nice and firm but not too firm give it a twist, you get about a quarter turn on that. That’s lovely, you should inspect it for any crazing, any fraying, anything like that that might indicate it’s about to part company with itself, that is a nice new belt. That’s fine battery, check the battery next. The engines got its own battery. Specifically for starting the engine. Make sure the terminals are nice and fast and indeed she is all strapped in and on a regular basis we’ll be checking the cells on the battery as well as that is all nice. L, L for leaks make sure that the engine well is nice and clean. The kitchen roll comes in handy again here. Should be able to eat your dinner off the bottom of the well of the engine. Because any leaks that might develop which would indicate a problems on its way that would be leaking into the well that’s all nice and dry down there. She’s happy. E for electricity. Quick look over your electrics. Make sure nothing is vibrating loose or chafing that sort of thing. Oh it is nice and good in there finally, we have S, S for strainer, here is our strainer. It is this device that filters the sea water that the engine draws in to cool the system comes through this device here. There’s a strainer inside that of any foreign matter and it gets drawn up from outside. It stays in the filter and we can get rid of it, so anything like Harry had like a plastic bag and Harry and anything nasty like that we can always get out and improve the water flow to the engine, our strainer. Leading the fuel system. If you get air in the fuel system. We need to get that air out before the engines going to work again. To do this manually, we have a lift pump on the side of the engine which will manually pump the fuel through and we release the vent screw on top of the fuel filter here. To do that I get my spanner, located on there, open that up, slacking her off, piece of rag, wrapped that around the fuel filter cause we don’t want to spill any diesel into the engine. And then on the side of the pump, we have the lift pump, the manual lift pump here. We can pump, pump the fuel throw from the fuel tank. Gets all the air out the system, bubbles at the top of the main screen when it stops bubbling out and we’re just getting fuel out we nip that up nice and tight. Job done crank the engine, she should fire there we go. That’s our daily checks down for our engine. Time to close up the compartment no and do our checks up top, nice and gently. Mind you fingers, let’s go up top. We have done our checks down below now it’s a nice time to check if the engine actually runs, here is our ignition key. Pop key in the little slot, there is our throttle, up and down this boat is neutral, let’s give it just a few revs, push the little clutch button in give it a few revs. Make sure everything sweet there and just like the car, crank her over, if it’s cold you need to use preheat, up she goes. Just give her a few revs to get the alternator charging. Now the first thing you’re going to do is check the cooling water is coming out of the exhaust because if it’s not, the engines going to overheat. Cooling water we can hear it. So let’s see as well. Loads of water pouring out there. Just a job. Engine running fine. We now need to make sure that she works under load, so with the boat nicely secured up as it is always the case when we’re tired and long side. Give a little kick ahead on the engine. Play to the middle, give her a few little revs. If you look out to the back. You’ll see prop washed coming out there that’s effects of the propeller on the spinning churning the water out, flowing out past the rather. She’s working good, into neutral, with a little touch of stern, there she goes, back to neutral engines fines. She works under load, we can now shut her down on this one we got a little fuel starvation lever there, pull that one out, engine is fine, when the skipper says it’s time to go. She’s already to run as you know learnt on you competent crew of course, we got firefighting equipment throughout the boat, here are just two of our far extinguishes. When you do you briefing as a skipper just make sure you crew know exactly where all the firefighting appliances on board are and how they work. One of the emergency situations you may find yourself as a skipper having to deal with is, a man overboard situation. Very serious is a mayday situation. The first thing you are going to is stop the boat, you stop the boat. Second thing is going to do, is send away the gear to mark the spot where the cash went over the sides. Mike send away the gear. Three things all done in the first second of some of falling over the side. You a skipper it is your job to make sure it gets done. You’re going to stop the boat, send away the gear, and hit the distress button. You think you’ll get the engine on, we’ll teach you the fast stop method of going back to pick up the casualty. You’re going to follow the. Then you’re going to sail downwind by at least four boat links. Turn around, come back a pick your casualty up. It’s a very practical demonstration and we’ll teach you that out on the sea. Taking the boat off the this is where as a skipper we have to work with our crew to make sure we get the boat, nice and sweetly away from the. Prior to all this we all make sure the boat is all ready to put to sea. That means making sure everything down below is all nicely stored and tucked away, because she’s going to move around a little, so I’ll tuck it all away. Let’s make sure the hatches are fully closed. Make sure she’s watertight ready to put to sea. Once that’s done. We’ll talk to our crew and have a little word how we’re going to get the boat off the well, as a skipper you need to decide how you can do that safely. And thats a great place to conclude this first section of the day skippering tuition, watch this space for the next installment….